"Your Survival Strategies Are Killing You!" « How Come I’m Not Getting What I Want? I always tell my employees that I won’t have anyone working for me who isn’t making mistakes. Why? Because as Albert Einstein said, “A person who never made a mistake never tried anything new.” They aren’t challenging themselves, being innovative, creative and curious. They aren’t stretching beyond their self-limiting boundaries, learning and growing. To risk losing is part of winning, but never losing means never achieving our goals. There’s a saying that . . .
and I believe that to be true. Those who live low risk, overly safe lives are missing a level of excitement, ecstasy and joy that is only available to those who dare to challenge the status quo, to those who try something new, to those who are willing to discover what exists outside the box. If, however, you find yourself making the same mistake over and over, then you need to have a talk with yourself before someone else does (like your boss), because that indicates you aren’t learning. All a mistake is, is something that didn’t work . . . it didn’t give you the desired outcome. Don’t beat yourself up, don’t be embarrassed and absolutely don’t quit! Simply learn what it has to teach you and keep going! However, remember . 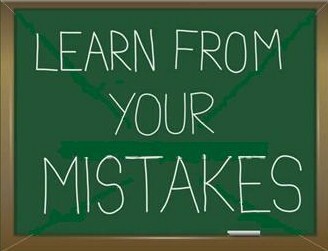 . . a repeated mistake means you have not yet learned the lesson you need to learn to move forward in your life. Imagine where we would all be if, as little babies learning how to walk, we thought falling down was a mistake. Imagine if someone yelled at us or was cross with us every time we fell over going from the couch to the coffee table. My goodness, we’d all still be crawling! So let’s be careful with ourselves and with one another, and let’s remember that a mistake does not mean someone is bad or has done something wrong. They simply had an opportunity to learn something and they missed it. That’s when you want to try again, this time a little wiser than before, and soon you will get it. Fear of reprimand, criticism or self-deprecating judgment can kill an opportunity to grow. Nothing of any consequence has ever been accomplished by waiting to do it so well, no one could find fault with it. In matters of honor and integrity, I believe we should not make others’ opinions the deciding factors by which we live. To be worthy of our own respect, I believe we must follow the path of our own convictions, a path that is solidly based in the values of love, mutual respect, honesty and trust. We must risk the disapproval and resistance of others and maintain a strength of conviction that through our example and commitment we can influence others. This will inevitably result in sometimes falling short of our desired outcome, but perhaps the greatest mistake of all is to sacrifice who we are for who we can become. "Your Survival Strategies Are Killing You"
May I Ask You To Open My Peanuts?